H. BLANDY was born October 26, 1810, at Bristol, England, where his parents lived thirty years. He came to this country with his parents, brothers, and sisters, in 1832, though he returned in the Fall, and came back in the following Spring, and went to Zanesville with his parents and their family, arriving there on a Sabbath morning in May, 1833. 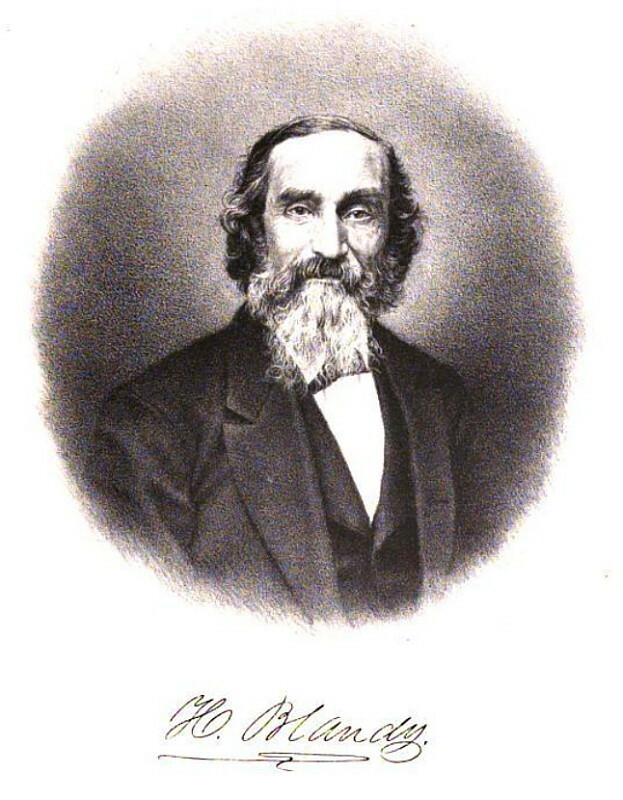 In the following February, Henry Blandy married Miss Amanda, the second daughter of Judge Blocksom, and at once started in business with Judge Blocksom, J. T. Fracker, and Lloyd Dillon, under the style of Dillon, Blandy & Co., in the prosecution of furnace and forge business, at Dillon's Falls, Mr. Blandy managing the store department. The business proved a failure, and Mr, B. lost every dollar of his investment. Another investment of a similar kind, and another failure, left Mr. B. $5,000 worse off than nothing. His next business engagement was with his brother and present partner, F. J. L. Blandy, in the foundry business. This proved a success, and enabled them to pay the interest on their borrowed capital and extend their operations. In time, they undertook to build locomotives, and also ventured into another speculation, that of building a rail mill—the latter they located at Ironton, O. Through the failure of their partner, before its completion, and the depression in railroad stocks, almost overwhelmed them, never wavering from integrity and zeal, they waded through their embarrassment, and paid every dollar they owed, principal and interest. They at once concluded to quit building locomotives, and enter the building of portable engines, saw-mills, and other machinery. They succeeded in establishing a fine business, so that when the crisis of 1857 came, they were in good shape. Unfortunately, their Southern correspondents and debtors, when the war came, lost them every debt, though the oil excitement and other channels soon righted them. In 1866 their works burned to the ground, losing $200,000. Fortunately, they owned large shops in Newark, and threw all the labor and extra machinery possible, running day and night, enabling them to hold their trade. They rebuilt their Zanesville works immediately, and since then have done a prosperous business; and during the excitement of 1873 they were panic proof. In 1859 Mr. Blandy lost his first wife, and was again married in 1860 to Miss Amelia Adeline Douglas, of Lowell, Mass., though lost her in 1867. In 1868 he again married, this time a sister of his second wife, Miss Nellie W. Douglas, who proves a devoted wife and mother to her sister's children. Mr. B. is very fond of race-horses, and owns a stud, numbering forty, many among the fastest horses known. The name of H. Blandy, Esq., carries with it a great weight and influence; and the purity of his character and frankness of disposition have endeared him to a large circle of friends.